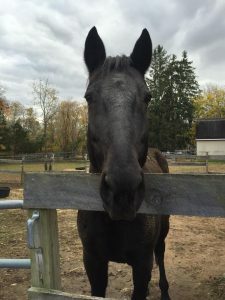 Laddie is a Standardbred, brown gelding. At 17 years of age, he is a force of nature with a strong mind, independent spirit and mischievous attitude. Laddie was bred, born and trained to be a race trotter. [Trotting is the sport of harness racing.] After surviving an injury and devastating bone infection at a young age [an infection that left him compromised for life], Laddie witnessed the death of his owner and found himself without ‘his person’ and without a home. Suffering from physical and emotional trauma and needing a place to heal, Laddie was welcomed to Phoenix Rising Equine Rescue and Sanctuary in 2006. Here, he is loved. Since his arrival, he has kept us on our toes as we have worked to keep him healthy and safe, while also respecting his tendency to be protective – of himself, his space, and herd mates. Recently, Laddie has found a friend in another Phoenix Rising herd member, Lucy. Laddie and Lucy live side by side at the farm; they live separately, yet together. Whenever you think one of the two of them does not care about or is not paying attention to the another – think again! One knows where the other is at all times. If you dare to disrupt their schedules and/or separate one from the other, they will let you know they do not approve! Often, you will hear volunteer staff referring to Laddie as “the dirty boy”. Boy is he ever! Laddie can turn a tiny speck of mud into enough to cover his body ten times over. He is always the first horse to roll and the one to get the dirtiest, the fastest! He is also one of the first horses to greet guests when they arrive at the farm and one of the first to look for a treat from those guests. With his dashing good looks, drive, power, and energy, people often shy away from Laddie. He is often misunderstood; he can intimidate both humans and other equine. If you take the time to look into his eyes, though, you will see a boy who deep down inside is very tender. He just wants to connect with that one special person who he can trust forever. Here’s to you, Laddie. Thank you. Thanks for reminding us to never give up. Thank you for reminding us that one can be strong and vulnerable all at the same time. Thanks to all of the Phoenix Rising supporters who allow us to offer a Safe Haven of Hope to Laddie and other horses in need.